Cook pasta in a large pot of boiling water until al dente. Drain, and rinse in cold water. In a small bowl, mix together oil, lemon juice, basil, garlic salt, and black pepper. In a large bowl, combine pasta, tomatoes, green pepper, onion, cucumber, and black olives. Add dressing, and toss to coat. Chill in the refrigerator for 30 minutes. I found this salad very bland. I even added feta and some oregano but still I found it rather tasteless. I would not make this again. Very nice salad, however I did add more seasonings than called for. To make it a little more Greek, I also added feta cheese. Thanks! I made this salad the night before a party I was attending and it was wonderful. 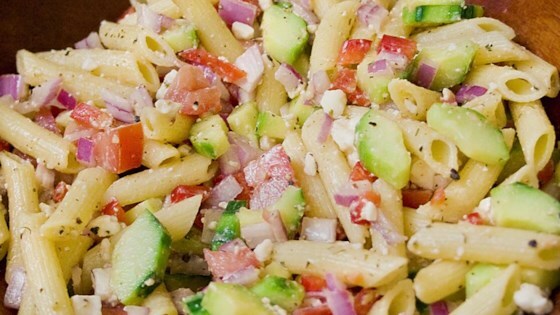 Excellent, easy, classic pasta salad...will always be a staple on a buffet table.